Fear is real. In fact, it is so real, it can seem to consume you all by itself. It becomes the favorite ploy of politicians who are desperate to control you, and merchants who need you to need what they have. Gas went up $0.10 overnight (actually as I bought it yesterday). I remember municipalities trying to get a half cent raise in gas to pay for some civic project or program, and the voters say no. Local gas station owners told, that drivers would flock out of town for gas. You would be ruining their lives and livelihood. So we do without the teachers raise, or the intersection expanded. We have learned to not trust government hardly ever (except by fear) in having its hands on one more cent of our hard earned (or not) money. I think of how, in relative terms, most of these little increases would have returned to us much, but instead, it now goes to a middle east nation, and or the corporations making a windfall off of fear, and a war over it is guesstimated now at eventually costing $3,000,000,000,000–$5,000,000,000,000 and all out of scaring us dumb with dubious rational. Fear diverts our attention with ease. Heck, I’d rather keep my one half cent, thank you big government tax and spend socialism very much. Now gas can go up a dollar each gallon in a year and we are still kept afraid of (and less able to afford) pooling our resources to do something fair, just or constructive. I have become cynical in the economic sense, since it seems proved out that every cent you think you kept by avoiding a tax, you will have taken from you more fold, in placing your needs into predatory control. No, not in the hands of voting institutions (representative or initiative) where you theoretically have a say and receive a lasting benefit, but into individuals or collective groups, who knows where in the world. Just probably not in the average voters house or neighborhood where you live. Just got to keep you scared to keep you in line. Attention Diversion Disorder. Interesting how the selfish, predators and the permanently afraid, rule our lives to some degree. Our doors are locked when once upon a time they were not. I travel as little as possible. I buy less of our consumerist/individualist-each must have their own products, cause somebody rich somewhere needs more for their nicely set up welfare for them state. That is how it is for more and more of us. You just will not see many movies or TV shows based on the third worldalization of our nation. But many a politician will speak glowingly of our special freedoms the world is so jealous of. Nanny state, closet socialist, communist Utopian, many words are used to now define the community doing good or needed works of one kind or another, by the fears of the poison pill word propogandist. While exploitation of the individuals situation, contempt for empathy and compassion, and getting away with what you can, or aligning with fellow opportunist to strip democracy of meaning, or of rights pertaining fairly to all, goes on quite unabated. The deck that has been stacked is the very old one, the opportunist and predatory one; take what you can and run. Humankind is always faced with what one can call Energumen (a spirit embracing misanthropic or malevolent intent to others), those who place their “own” above all else, and serve that separation from the whole, as itself being holy. Resource depletion, pollution, the reduction of the authority of the individual in the responsible collective sense; where we accept that we still live and breath the same air on the same planet and must so act therein responsibly, assaults of these are the greatest looming threat to the planet and so to us. That said, terrorism is the greatest present threat to the western world. Much of the rest of the world is or has been ruled by this greatest threat as well, but now in the USA, terrorism is the greatest threat of the present moment, because so few callus dysfunctional’s can cause so much fear, harm and disruption of life and economies, not to mention the soul depletion of removed liberties. If you are liberal, you do need to take terrorism’s realities into account, along with your hopes and fears for the future. I am not suggesting ignoring the source of the mindset that produces lives whose only value seems to be to destroy someone different who is blamed for their plight, rightly or wrongly. That is what manifest terrorism. It is also necessary to state that our own revolutionary founders would be considered terrorist by the then British status quo. As has been often said; one mans terrorist is another’s freedom fighter. We must determine in this diametrically opposed perception, a truth beyond subjective impression, to where the real truth of the matters are, and what the honorable and rational action and reactions should be. If you think of humans moving into space (from exploration and or population pressures), we will have had to manage the potential of disaster, of just one dysfunctional and disgruntled individual. Imagine the degree of control by state, or the maturity of the spirit of the populations, to be able to trust catastrophe not ensuing from one of their peoples intentions. Terrorism (of all kinds, including good “defensive”-offensive ones) on the planet is not far from doing the same thing here on spaceship earth. We face a coming wall regarding globalization and individual and collective rights and responsibilities. I am of the mind that as in all addictions, it is not force or words that will cure us of the oppression of the out of control state, religion-state, or the out of control individual. A rebirth of self, strange as that can seem to mean, is what will break fear based addiction by the individuals own motivation. When the promise to Life (or God) comes originally from our own hearts and minds, a new world opens up. Life is unveiled and Its astounding presence sensed. This Big Spirit surrounding everything, leaves nothing out or discarded by human concepts of division from the Whole. It is Unconditional Love, pure, simple and true. It does not need me to defend It or say Its Name correctly, nor beg properly, or pander unending to Its omniscience. It is an invitation to exist inside of Its intention, Its unfolding definition alive in my own life, as in all things. I can share in the miracle, which even includes suffering and loss as poignant counterpoints to being, or I can embrace the myriad pathways to fear. Letting them, ground my spirit to inert dust, worshiping all I lack as evidence of illusions primal abandonment (my detachment from Cause). It will be the heaven at ones own hands, or the heart eating jungle, that will be produced from what I chose to do or not do. The fate of the world is made up of that magical choice in which direction we each lean, until it becomes a driving wind. 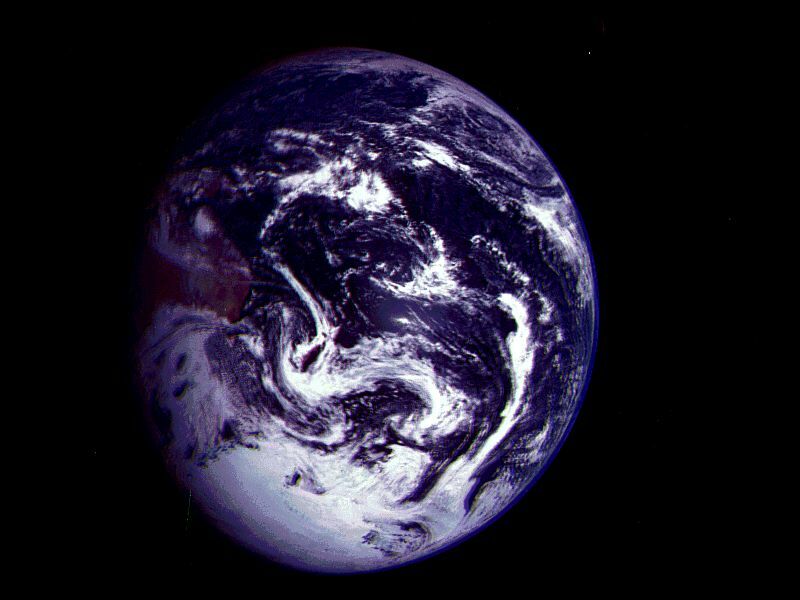 These images were taken by the Solid State Imager (SSI) on Galileo during its first flyby of the Earth in December of 1990. The images were all created by Dr. Edwin V. Bell, II (NSSDC/Raytheon ITSS), from separate filter images present on the Galileo Imaging CD-ROMs.